The best examples of innovation and initiative in defence were honoured as this year's winners of the GEMS suggestion scheme were announced at the Tower of London on Friday, 16 July 2010. The GEMS Scheme was introduced in April 1996 as the single Defence-wide suggestion scheme and in that time dozens of suggestions from all over defence have saved the department millions and improved the working lives of thousands. The scheme is considered the third most successful of its type anywhere in the world and more than 2,000 ideas were put forward to the GEMS team in the last year. The finalists in this year’s scheme ranged from money saving ideas to prevent radar towers being destroyed by insurgents, environmental ideas to recycle waste and operational benefit ideas to reduce the maintenance burden on helicopters. The winning presentations were made by Permanent Secretary Sir Bill Jeffrey and Chief of Defence Staff Air Chief Marshal Sir Jock Stirrup. The GEMs Scheme saves a lot of money - £18m in the last year alone. That in itself would be more than enough justification for the scheme but to my mind it goes well beyond that. It talks to whom and what we are as an organisation. The categories for the awards were; Most Environmentally Friendly, Most Safety Improvement; Most Innovation, Most Operational Benefit, Most Business Improving and Best Example of Modernisation - with a new category of Best Idea of the Year for the overall winner. This year the recipients of the Best Idea and Most Operational Benefit were Commander David Bartlett, Major Mike Jeavons and Warrant Officer Class 1 (Air Engineering Technician) Austin Harding for their idea of overhauling the servicing package for Apache helicopters. 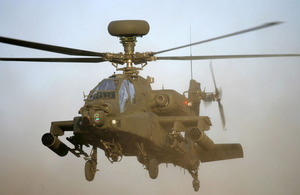 Prior to the trio’s suggestion, Apache helicopters were flown back to the UK from Afghanistan for their 300 and 600 hour service intervals, severely restricting the number of flying hours available to commanders in Afghanistan. However, Messrs Bartlett, Jeavons and Harding used their knowledge to change the service packages and submitted their plans to the GEMS scheme in 2007. After testing and evaluation the plan has been implemented with the result that the 300 hour service now takes the helicopters out of action for only five-ten days as opposed to the 60-70 days before. The idea has produced cost savings of £4.2m in the last financial year and increased flying hours in Afghanistan by 330 per cent, not to mention relieving pressure on the air bridge as less airframes are transported back and forth to the UK. The idea will now go forward as a nomination for the Ideas UK, which looks for the best ideas across all business and public sector organisations in the UK. Many of the other ideas in the GEMS award scheme this year had safety at their core, such as Flight Sergeant Justin Wooley’s idea for a map stowage on the Griffen helicopter to prevent documents falling from the cabin into the engine, or the idea from Corporal J W Potter for a system to prevent the potential of 55 feet (16.8m) falls from the back of C-17s. The Most Environmentally Friendly Award went to Keith Allen for his work on the disposal of contaminated waste from Defence Storage & Distribution Agency West Moors, an idea that has saved £96,000 over three years. Perhaps the simplest, though no less effective, idea came from Terry Grant who won the Most Innovative category. He was asked to look at solutions to the problem of the Typhoon aircraft accessory gearbox blanking caps coming loose during flight and falling in to the airflow while the aircraft was in flight - a dangerous and expensive occurrence that was happening around eight times a year. Mr Grant was asked to produce either an elasticised or stronger material for the lanyards on the cap to prevent them being lost. However, on being shown the problem Mr Grant simply produced a split ring from his pocket and connected the two lanyards together. As both caps have never been lost at the same time this was seen as a viable solution and is now implemented across the entire Typhoon fleet. The 5p split ring is predicted to lead to savings of £49,200 over the first three years. Maybe Yes this page is useful No this page is not useful Is there anything wrong with this page? Don’t include personal or financial information like your National Insurance number or credit card details. To help us improve GOV.UK, we’d like to know more about your visit today. We’ll send you a link to a feedback form. It will take only 2 minutes to fill in. Don’t worry we won’t send you spam or share your email address with anyone. Don’t have an email address?